Calcio Avellino Società Sportiva Dilettantistica is an Italian football club based in Avellino, Campania. The team plays in Serie D due to submitting unsatisfactory paperwork to Serie B. The progress of Avellino in the Italian football league structure since 1960. It is the official continuity club of U.S. Avellino, who went bankrupt in 2009 and then was excluded from Serie B in 2018, admitted to Serie D by Article 52 of N.O.I.F. in the same year. The club was renamed as Associazione Sportiva Avellino 1912 in 2010 and restored to the original Unione Sportiva Avellino 1912 in 2015, before assuming the current denomination in 2018. The club was founded as U.S. Avellino during 1912 to give the town of Avellino a footballing representative. The early history of the club is quite obscure as they only competed at a lower level against regional sides. Avellino competed in IV Divisione from 1913 until after the Second World War; today's equivalent of that level is Serie D.
For the earlier part of their history the club did not achieve anything of note, until being placed in Serie C for the 1945–46 post-War season. In the 1946–47 season they narrowly missed out on getting through to the interregional final, after finishing third in their group. Avellino beat out the likes of Catania, Reggina and Messina to win promotion to Serie B at the end of the 1940s. However, the club were accused of match fixing and the federation decided to strip them of their promotion, instead relegating them down to Serie D. Although they were able to return to Serie C after one season, Avellino were relegated back down to spend six seasons in a row at Serie D level. Eventually Avellino returned, but in the space of six seasons, Avellino gained promotion to Serie C in three of them and were relegated back down twice. Avellino were promoted to Serie B in 1973 and Serie A in 1978. A truly remarkable feat for a southern provincial side was a 10-year stay in Serie A between 1978 and 1988, with the club holding a mid-table place for the majority of that period. 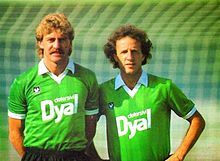 Their best finish was 8th in 1987, with a team starring Angelo Alessio, Paolo Benedetti, Franco Colomba and Dirceu. The club has tended to shift between Serie B and C1 in the years since. More recently, the club marked a Serie B return after defeating neighbours Napoli in the Serie C1/B play-off finals. An unsuccessful 2005–06 campaign ended in a loss on relegation playoffs to Albinoleffe (0–2, 3–2). The 2006–07 season, with Giuseppe Galderisi as head coach, then replaced by Giovanni Vavassori, ended in a second place in the Serie C1/B regular season; this was then followed by a successful campaign in the promotion play-offs, in which Avellino defeated Foggia in the finals, being therefore promoted to Serie B once again. However, this was followed by Vavassori's resignations on 16 July 2007, shortly after his confirmation as Avellino boss, being then replaced by Maurizio Sarri two days later. Sarri himself resigned one month later, being replaced by Guido Carboni and later Alessandro Calori. Despite this, the club did not manage to escape relegation, ending the season in 19th place. The club was however readmitted to Serie B later on to fill a league vacancy created by Messina's disbandment. The team finished second from bottom in the 2008–09 season and was therefore relegated. On 9 July 2009, the Covisoc (Commissione di Vigilanza sulle Società Calcistiche, Vigilancy Commission on Football Clubs) organization announced that the team did not pass the financial requirements in order to be admitted to the league. The club was allowed to appeal the decision until 11 July 2009. On 11 July, Avellino failed to appeal the exclusion. A new club founded in the summer 2009 as Avellino Calcio.12 S.S.D. restarts from Serie D, finishing 5th, but 4 August 2010 they were later admitted to Lega Pro Seconda Divisione to fill vacancies. This ordeal saw them become the latest in a long line of Italian clubs that have faced severe financial difficulties, such as Napoli and Fiorentina. In the 2010–11 season the team became Associazione Sportiva Avellino 1912 and played in Lega Pro Seconda Divisione finishing 4th, being defeated by Trapani in the play-off final, but 4 August 2011 it was later admitted to Lega Pro Prima Divisione, again, to fill vacancies. In the season 2012–13 Avellino won Lega Pro Prima Divisione and the team obtains the promotion in Serie B. In 2018, Avellino was excluded from Serie B due to submitting a league membership paperwork that was deemed as incomplete, due to a late bank guarantee. Due to this, new club was refounded within days in order to submit application to play at Serie D instead. Its traditional colours are green and white. 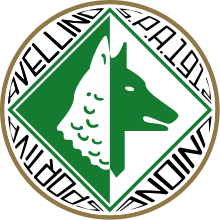 Avellino are nicknamed the "Lupi", which means wolf, and their club crest displays a wolf head. Avellino has many supporters despite the size of the town. Majority of fans come from the city and its neighbourhood but also from northern Italy where many of them are emigrated. Principal rivalries are with supporters of other regional teams like Salernitana, Benevento, Napoli and Juve Stabia. There are also rivalries with Foggia, Bari, Taranto, Catania and Verona. Nowadays there aren't official twinnings but in the years of Serie A there was a twinning with Juventus. Friendships are with supporters of Messina, Nocerina, Trapani, Sambenedettese, Cavese and Casertana. Adriano Lombardi, Midfielder (1975–79) – posthumous honor, number retired in 2007. Florinel Milog Tanase, Midfielder (2019) – posthumous honor, number retired in 2019. ^ "Ritorna lo storico logo "UNIONE SPORTIVA AVELLINO SPA 1912"" (in Italian). Irpinia24. 9 July 2015. Retrieved 11 July 2015. ^ US Avellino (16 July 2007). "ALLENATORE PRIMA SQUADRA" (in Italian). Archived from the original on 28 September 2007. Retrieved 16 July 2007. ^ "ALLENATORE PRIMA SQUADRA" (in Italian). US Avellino. 18 July 2007. Archived from the original on 28 September 2007. Retrieved 18 July 2007. ^ "Iscrizioni: 16 squadre non iscritte in Lega Pro" (in Italian). tuttosport.com. 8 July 2009. Retrieved 20 September 2009. ^ "CALCIO, TREVISO: NIENTE LEGA PRO, QUATTRO ANNI FA ERA SERIE A" (in Italian). La Repubblica. 11 July 2009. Retrieved 11 July 2009. ^ "Da Venezia ad Avellino, l'Italia cancellata" (in Italian). La Gazzetta dello Sport. 11 July 2009. Retrieved 12 July 2009. ^ "COMUNICATO UFFICIALE N. 24/A (2009–10)" (PDF) (in Italian). FIGC. 21 July 2009. Retrieved 11 July 2015. ^ "CALCIO, LEGA PRO; RIPESCAGGI: 5 IN I DIVISIONE E RIMINI IN II - Sport - Repubblica.it". sport.repubblica.it.